Despite defeat this was altogether a better day than the day before. A side of mixed ages performed creditably against a strong Bledlow X1 in the Bucks Knockout Cup. The Ridge batted first and when the score was about 50 RolfeDog missed a straight one and was out for 17. Dan Maunder joined Russ “ George Michael” Turner who was already in Wham mode and basically the two of them hogged it all afternoon. This meant that us others could walk around the ground a few times and were able to talk to a photographer and look at the Cricketer Calendar 2009 featuring attractive grounds from around the country and especially a cover shot of a steam train passing the Bledlow ground. Today the train was being pulled by a dirty diesel engine so the photographer had a rather wasted trip. Well he needn’t have as he could have taken photographs of o George Michael making his way to 89 with powerful drives and pulls. At the other end Dogged Dan applied himself with all the élan of someone who has chosen St Andrew’s Uni over Bristol on the basis that a mate has said “it’s great up here and your golf will improve no end”. Scott joined Dan and kept the score going, Dan passed fifty and SamDog was able to go out for the last ball of the innings with multiple pieces of advice in his ears. In fact as ratios go, he was given more advice as to what to do per ball faced than any other batsman in history. Unsurprisingly he was baffled by a slower ball (how is it a ‘slower’ ball when you have not faced any?) and patted it back to the bowler. So Dan and Sam both managed to be not out. Tea was excellent, especially the pineapples, it being so hot – the weather not the pineapples. Matt Donnelly opened the bowling and tore down the hill a la Steve Harmison with his mighty leap before delivery. Matt Donnelly: where have you been?! With a bit of practice and occasionally a fuller length, a career as a fast bowling all-rounder beckons. Eat yer heart out Mark Dakin. Matt also achieved a first of running into bowl with a large blue plastic marker stuck to the sole of one boot before catapulting it into the air as he let go of the ball. Jabber Shirley and Matt Bolton are a formidable opening pair, nevertheless both Matt and Jake asked a lot of questions, sometimes even more than Jabber could answer which, in the words of David Coleman is “quite remarkable”. David Maunder asked a lot of questions too, in particular “Why does everyone insist on calling me “Dan”? My name is David?” We resolved the problem by calling the two brothers Red Dan and Blue Dan according to their caps. Matt was rewarded not only by clean bowling Jabber but by clean bowling number 3 next ball. Both batsmen were able to see some arm-punching out of the corner of their eye as they left. Doug bowled some rather good off-spin eventually winning an LBW decision. He was quite proud of this but surprised to learn that all the credit was going to SamDog behind the sticks. You see, there had been a comment from the batsman and SamDog smelt weakness. The batsman bit, and after a few verbal exchanges his concentration was ruined and with it his innings. This is why I deny any kinship to SamDog when on the cricket pitch with him. We took another wicket somewhere, I think it was Jamie but senility and a lack of scorebook prevents me from describing it. With Bolton approaching his ton we were not going to win the game but our ground fielding was excellent and our performance so much more dynamic than the day before. David’s throwing arm is injured, however this did not prevent him from loudly saying things like “I am happy to field there but I can’t throw” and to advance similar arguments worthy of an Oxford English Graduate (or is it an English Oxford Graduate?). Jamie felt it best not to inform the opposition’s batsmen of our weaknesses in this way but he had not allowed for David’s calculation that they would see his comments as a double bluff, and was thus able to go through the whole afternoon without having to actually throw the ball. We did have some other excellent throwers in the side, Jake, Matt, Dom and Dan and most fielders at one time or another took a leaf from Jamie’s book and managed to stop the ball with a forward roll. This culminated with Doug taking a very fine diving catch at mid-on, our fifth and final wicket. We were grateful for Jim Spooner of Bledlow scoring all afternoon although occasional glances at the scoreboard suggested that his electrical impulses were sometimes a little slower than the scoreboard’s. Regrettably he did point out that they had been quick enough to get me out earlier in the season. We learned that Dan’s fifty was his last appearance of the season and this prompted one of those monologues from his brother at the end of which we were still not quite sure whether he too would be able to play again this season. He has clearly been listening to Malcolm too much. Lost by – OMG – 145 runs! Little did The Ridgemen expect to face a side led by the former producer of The Beatles, George Martin. For the Ridge it proved A Hard Day’s Night. This was the first of number of dastardly tricks by Plumpton and East Chiltington which caught The Ridge unawares on the day, culminating in a performance where our guests not only had the temerity to bowl straight and field well they also threatened to outplay The Ridge on the social front too. To make matters worse it seems they have two George Martins at the club (cue: “There’s only two Geo-orge Martins), so it was not surprising they brought a coachload of Day Trippers, travelling Across the Universe and up The Long and Winding Road to the Ridge, everyone on board presumably having a Ticket to Ride. Mind you we played mind games too: our Chairman had with subtlety reserved a parking space large enough for his Morris Minor, into which the coach driver was expected to squeeze Plumpton and East Chumpington’s 53-seater vehicle. Then on disembarking they were encouraged into thinking The Ridge consists only of midget cricketers until discovering they were watching an Under 10s match, as part of a crowd-pleasing warm-up before the main spectacle. At least the victorious Under 10s could celebrate with a team-belly-dive, something the seniors dare not ever try for fear of being unable to get up again. Moreover, being from a part of East Sussex known for flooding it was to be expected that our adversaries had never ventured far above sea level and would suffer from the effect known as Ridge Giddiness Associated with Dwellers from Ground Level. But they were inspired by their surroundings. I heard one supporter comment on a large bird and For the Benefit of Mr Kite I can reveal it was a red one. And You Bird Can Sing he added in what I thought at he time was rather a contrived effort at getting into this match report. It is worth mentioning now that in the after match ceremony our esteemed Chairman failed to pronounce our opposition’s name correctly despite several attempts. I shall use all the names he tried during the course of this report. The Ridge had a difficult decision to make while Plumpton and East Chikrington acclimatised, as Ben, Lord of All Bledlow declared himself: ‘completely unfit, fine, able to bowl nine overs, doubtful in the field, as fit as ever, fine, unfit,d ecisive, indecisive and not-so-sure’. Henry Hale for his part was ‘playing, not playing, possibly playing and not playing’. Where Jock McTaggart, stood in all this as the nominated left-arm over replacement is unknown. In the end Ben was appointed to guard his newly acquired hay field adjacent to the ground. Plumpton and East Chunderington won the toss and elected to bat. Charlie Wycherley, whose name you might recall as that of a farmhand from The Archers fell for Mark Dakin’s long-hop trick which resulted in a running catch for Shaky (no E) who this season is proving to be a very fine long leg or a very long fine leg, one or the other. In fact his combination of fine and long legs may account for his off-the-wrong-foot style of bowling. More later. Tom Freeman hit one cover drive but was given out to a very fine LBW appeal by Brez whoseTwist and Shout impressed the umpire. This brought out Callum Smith to join Captain George Martin Junior IV and with it one of the most dastardly tricks of all. You see, in a pure act of intimidation the giant Smith wore a shirt saying “4 - Bully” a point only brought home to me on watching the Euro Finals that evening and seeing an Italian with a shirt saying “2- Abate”. If only we had thought of this. We could have all turned out with shirts designed to demonstrate fearless attitude : “5 – Resist” for example, “7-Counter-Attack”, “9-Argumental” (for Geoff) “6-Comatose” (Dakes) and so on. More practically, if Russ had worn “Turner” on his back they might have been in fear of spin bowling: better still the whole team could have worn the captain’s name – Brzezicki – in which case Plumpton and East Chilterns would have simply become confused and gone home. George Martin Junior IX insisted on being particularly friendly and chatty while flailing our bowling to all parts. This made sledging rather hard although Samuel ‘Keeper took one play-and-miss as evidence that the batsman was losing it completely, an impression swiftly corrected as the ball travelled through mid-wicket into the hay. Nevertheless a big moment came. And went. Said batsman nicked one of Dakes. To slip. Now few slip catches are easy, as Geoff so rightly says. Nor was this one. Particularly. Unfortunately for Geoff , George Martin Junior made about another 70 and later gave the Chairman the opportunity to mention Geoff by name in the after match speeches, prompting Geoff to remark “How can you laugh / When you know I’m Down?”. At least it all served to remind us what a very fine slip fielder the Chairman himself had been. Shakey (No E) bowling with two long legs replaced Dakes (9-1-29-1). Luckily Lord Ben of Bledlow had removed the fencing along the ground during the week making it easier to retrieve the sixes hit off Shakey (no E)’s bowling. In short George Martin III made hay while the sun shone. (I’ll Follow the Sun). At the bottom end Geoff Tombsdog came on to bowl with two short legs, a tubby chest and a field spread. Eventually he intimidated the Bully and then Jamie castled George Martin XXIV for a fine 86. Glyn Wells (33no) smashed a few before Brooksie came on for a bit of a laugh at the end so Karen Speirs was able to have a bash and end with 8 not out. At one point Capt Brez swapped RolfeDog and Shakey in the field on the basis that Shakey (no E) was quicker than RolfeDog. This was a bad error of judgement by both of them as RolfeDog bears a gridge and was to get his revenge on both of them during he The Ridge’s innings. 192-6 to beat on a slow one. We had high hopes that Plumpton and East Chumbledon would succumb to a magnificent tea. Chief Chef Christine had spent weeks interviewing and recruiting her team, ensuring there would be no internecine warfare within her ultra-competitive team. Sharon was reminded that teas are being marked this season. The numbers are still being added up for this one. The Ridge’s dismissal for 59 all out suggests the report should be brief from now but this innings was not without incident. Firstly we had cause to celebrate when one of our players, Conor finally reached double-figures. Problem was we had been 15-3 off 9 overs and it never got much better. Unseen by us the supporters of Plumpton and East Chittering had brought their own wicket which they unrolled onto the square during tea. They then proceeded to bowl straight on it all innings and field properly. All against the spirit of the National Village Knockout Cup. As we slowly expired there were two brief and emotional events strongly influenced by the presence of The Beatles former producer,d the field-positioning change in the first innings and though it pains me to say so, your scribe was involved in both. Brez called RolfeDof for a quick single. RolfeDog replied with “Get Back” (“Get back to where you once belonged”) and then “Hello Goodbye”. Brez replied with “**?!! “££$”8* :£”**” which roughly translated as “I’ll Get You” as he walked, no stamped off. Thus unnerved by this event Shakey (no E) came out and told RolfeDog; “Johnny B Goode”, but no avail as he too went the way of Brez although a trifle unlucky with the run out decision. RolfeDog thought: “Help!”and wondered if it would matter “If I Fell” on my sword but Idecided “I’ll Cry Instead”. Shakey was followed by TombsDog and RolfeDog by Henry Hale as we finally X Haled, beaten, no trounced by a rare tribe of East Sussex Travellers, who were inspired by the famous mountains of Bledlow Ridge and able to perform to their maximum in the rarified atmosphere. The Chairman excelled himself in the post match ramble that passed as a ceremony although he was saved from a week of cold rice, by a speech from Karen Spiers, the Plumpton and East Riding No 8 Bat, Hon Fixture Secretary, Hon Secretary, Chairman and 2nd X1 Captain who remembered to thank Mrs Chairman and her team for all the food. In one last dastardly act farmhand Charlie Wycherley stepped forward to say how much he enjoyed reading The Ridge website, thereby imposing considerable strain one of its major contributors to perform. Fortunately he made part of my job easier by spending the evening wearing the shirt that Englebert Humperdink must have worn in his first Eurovision Contest in 1946. Doug MacIndoo tried to increase the pressure by lifting a plate of food in the air and saying “Rolfey: the steaks are getting higher. “Hey Jude” I said to Dog’s wife, “is he usually this witty?” and unfortunately for him he then dropped the plate and I was able to counter with “The chips are down”. Anyway the farmhand’s generous gift of a bottle of wine called – I think Ridge Cloud – was last seen being consumed by Mrs Chairman at about 9pm. The travelling band from East Sussex stayed a long time. Some Cherwell sides could learn a thing or two. We sympathised with the oppo’s scorer for having to sit with Sid all day, and his mate sympathised with Sid for having to sit with him. It was all very matey and worthy of a pre-season away fixture I would suggest except that few Ridgemen would be able to get the four days off work necessary to get there and back again. So Plumtown and West Childetown continued their Magical Mystery Tour in the VKO. They left reluctantly (several admitting “I Don’t want to Spoil the Party”). One supporter even left with a bottle of beer sticking out of each back pocket. If your are going to get beat badly, might as well get beaten by a bunch as sociable as that. There is a serious footnote. RolfeDog and Captain Brez had not spoken since the fall of the 6th wicket. We met in the Gents. Nothing perverse about that, it is just that I spend a large proportion of my time there at this age. We decided that it was just A Day in the Life, to Let It Be and that All you Need is Love. Luckily, seeing where this discussion took place Brez said “I Want to Hold Your Hand” which for me was by far the best of the available alternatives. And so we left for home eventually too, but not before watching Jude McIndoooo flail her younger son’s bowling in much the way George Martin Junior CVXXIV had done to us; and not before a sit down meal organised by our indomitable ladies (of whom I realise Catherine Grose has not had a mention: Grose negligence on my part). And so a long day ended. As Saint later reminded me, it was a good day for the Ridge on the pitch as well as off. After all the Under 10s had won and perhaps on the day they should have played Plumpton and that other place instead. For my part, I will still remember the day, When I’m Sixty Four. On what turned out to be a Ridge Family Day, the Bears defeated Stoke Green by 23 runs and 17 large glasses of wine. The U13s narrow defeat at the club in the morning provided what might loosely be described as an overspill of support, just as the amount of wine supplied to Shaky (No E) – who gets a disproportional amount of coverage on these pages – spent the afternoon fighting an overspill of claret. The game was dominated by wine, the McIndoe’s family Father’s Day lunch (which had to be fetched from Marlow and cooked at the club, as Doug could not be moved from the bar) a RolfeTea and all sorts of evening refreshments. Ah! The cricket. BenDog was an early victim as the Ridge batted first and Baz Hawkins was the second victim as he pulled his groin quite dramatically so that BenDog returned as what might loosely be described as his runner, though with the two of them there it looked more like a fashion show. After Baz was out for 18 Russ and ??? had a bit of fun on a very slow low wicket, before Russ went for 14 to the same low one that had got Baz. RolfePup built the innings with Tombsdog but the dismissal of both batsmen for 22 and 28 respectively, followed by Jamma to a great catch put us back to 104 for 6 with only 11 overs left. BirdDog however and the Might Dakes put on over 50 to help us reach 162-7 which on that wicket we felt should be enough. 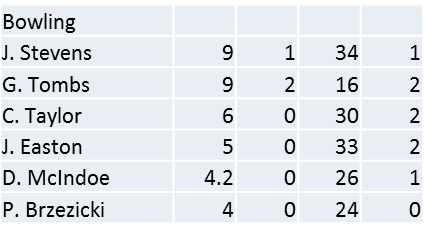 Jake was the only player unfortunate to find himself below RolfeDog in the batting order, neither of who was required. Jake did however have a long innings against his father’s bowling instead of tea and was nearing his 50 by the time the scones ran out. At this point I must apologise for the rather boring couple of paragraphs above about cricket. I know you don’t read this for the cricket. Shakee was being plied with glasses of wine the size of a half bottle and Doug was getting steadily noisier. Russ Moran of the recently purchased Jaguar car was there too having just returned from Italy no doubt as part of his benefits package from the chairman as long as Russ negotiated a special deal with the Vineyards of Tuscany while he is out there. Stoke Green kept wickets in hand but were pegged back by the bowling of a Sloth who had earlier revealed an unknown burst of pace when batting. He bowled 9 overs 2-28 and he and Captainn Brezza who took 0-18 off his 9, got the Ridge in a strong position and Stoke Green never quite recovered although their middle order threatened for some time. This was partly due to a bit of mild sledging from the Quiet Man of the Ridge, Mr Turner who managed to catch and later run out the two best players one of who had been the victim of this verbal abuse namely “He hasn't middle one yet”. Geoff who is fair to middling at most times, took 2-40 off 9 and displayed some fine footwork off his own bowling which Shaky would have approve of had Shaky not by now been lying comatose on the boundary pretending to be asleep on the phone as it were. BenDog also took 2-40 off 9 just proving what soulmates he and Geoff are even if Ben has a bit of catching up to do in the fashion stakes. As Shaky tried walking back to the pavilion along the boundary line, Jamma took 3-16 to finish off the game which was now completed in a torrential downpour. Under the law of ‘Taggart at Great and Little Tew’ (see other report) it is now decreed that cricket should continue in all weathers. Needless to say that the crowd of supporters had all disappeared inside to prepare their voices for a rendition of “We are the RidgeBears, the Mighty Mighty RidgeBears” which was later led by BirdDog. As the game finished one supporter remained outside: the redoubtable Doug of course who stood in the pouring rain gesturing how daft it was for the players to be standing in the pouring rain. The final rounds commence in a fortnight and it is rumoured the game will be at home. This will mean another trip abroad for Russ Moran to supply the ever increasing thirst of the Ridge’s hearty supporters. 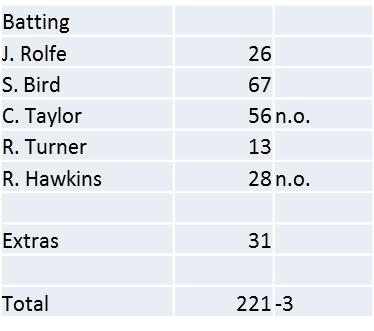 In front of mum and dad and uncle and auntie, Phil Brooks followed up his score of 87 with 5-21 in what must be one of the low points of Bledlow Ridge CC’s history. Yes, there was so much talent on display but somehow Brooksie was able to claim Man of the Match although my choice would have been Steve Bird for most visits to the Khasi as he continued to suffer from the sight of a curry the previous night. We started averagely as we had forgotten to collect Matt Donnelly and Jake Easton at the club; bringing our team is a small point but one we ought to address really. Fortunately for us they arrived anyway. We batted and in the (rather personal) circumstances Steve Bird declined the opportunity to open, in favour of RolfeDog who got off the mark eventually, after about three weeks it seemed, with an all run four prompting his good mate Brooksie to remark that he can never have started with a four before; ha ha. RolfeDog created a minor incident by objecting to the repeated arrival of the opening bowler at his end in what might be described as a long follow-through were it not more like a walk in the country. Everyone was put out of their misery when he was out for 14 and Russ was able to bore us all to death for a while before Henry arrived. In fact Henry had arrived at the match just pleased not to be within earshot of his twin nieces with whom, among others he had just shared a holiday. Evidently these nieces make more noise than even Steve Bird. Henry was caught and then MorfDog joined Phil and after a few beautiful shots from Morf for no run, several marvellous ‘leave’s for no run and a generally good bit of posing, set about the Cublington attack which had proved quite difficult up to now on a slow track. Morfdog made 49; reasonably amusing as he only found this out after the game, the scoreboard having shown 39 at the time. Jamma went in six but could not get the strike. Birdy went in seven and to our amusement was run-out by a fielder lying on the ground who threw down the stumps with his wrong hand. Birdy made “0” although other evidence suggests that he had made enough runs elsewhere during the afternoon. And on this subject it should be mentioned that Cublington is a smashing ground with a really nice pavilion but it has only one toilet. I know you don’t read reports for detail about this sort of thing but it does create problems not least when one person, and it only takes one, is having what might be called an “off” day. TombsDog mowed hard and was well caught. Finally The Lord of Bledlow marched to the wicket to make a gallant 8 or so not out. He is the most-dressed batsman at the Ridge, with an array of body armoury and cricket fashion although as a banker strangely he had no “caps” and no “collars”. After tea he opened the bowling. Very stiff from his bowling the day before we were afraid he had reached junk status and his pace was definitely down-graded so much so that he bowled at a fixed rate. Luckily he was nowhere near Steve Bird’s overdraft and emerged from the day with credit albeit no wickets. Geoff TombsDog took 3-17 off nine accurate overs and much field-placing and his spell set Cublington well behind despite a decent start. He was indebted to Matt Donnelly for two catches, one a big one in the deep where we were all relieved to see him and not MorfDog under the catch. Jamma, 2-23 had bowled at a slightly variable rate at the other end and bowled their dangerman with a grubber and then Birdy caught a skier off him, catching the ball in a sort of lavatorial position, all of which, I am sad to say, paved the way for Brooksie to bowl. God help us. His first wicket was celebrated with the enthusiasm of someone who had just won the lottery, and his next three wickets generated even more excitement until with the score on 118-9 their No 11 tried a reverse sweep, and Phil was awarded an LBW by his father which went something like “How’s that Dad?”, - “That’s out son, and we’ve won, now let’s go and see your auntie and uncle”. So we progressed to the area final and said goodbye to Matt Donnelly but not to all his kit of which his shoes were left in RolfeDog’s custody; this following the rescue of his sweater two previous weeks in a row gave me my first ever hat-trick… which must beat Brooksie’s five wickets any day. If you have read the report of Saturday’s match at home to Oxford 4s this was much the same. A Ridgebear batted for a long time while the others all chipped in and then the team bowled the opposition out cheaply. Well there were a few differences. Like the panic call from Jamie announcing a 1.30 pm start not 2.00pm as advertised. That bag of grass cuttings bound for Wigans Lane queue at 1pm had to be dumped in the top corner of Meadow Styles. There was a lot of general running around. SamDog announced that not only had a mouse taken some chunks out of his cricket shoes during the winter but had also laid eggs in them... “If mice lay eggs”…. “It’s a mammal you idiot” came an authoritative voice from the doorway and in this way Geoff made his entry to the changing room, the season and indeed, our lives. Rodders was there after the previous day’s shenanigans and marvelled at how a mere eleven kit bags could take up the whole dressing room floor. Well ten actually as his Asda bag did not cause much of a problem. Brezza won the toss and we batted. RolfeDog and BirdGod (sorry I am dyslexic) put on 50 odd until the former traipsed off gloomily to be replaced by DougDog – easy for you to say – and he and Birdy built the score up wickets in hand enabling Dakes with 22 and Brez with 18 (he only hits sixes) to add to Doug’s 29 so that we ended on 192-6. Oh and yes,Birdy made 80. Well done and well run he and Doug who has had a fine fitness workout this weekend. I chased a six by Dakes into the Stud Farm where the tractor operators were not bothered so I introduced myself to the Lady of the Manor and her pack of Dogs. I am not sure who was happiest to see me and I did not find the ball but the subject of ‘needing a net’ was mentioned by which I assume the Lady meant to protect her dressage, not to improve her batting skills. I silently noted that the fence between our properties has just been removed, no doubt in a move to get a better view of the cricket. Dakes took a wicket with his second ball however much of their innings featured the Worlds Happiest Scotsmen, Taggart and DougDog. Taggart bowled a perfect line ending with exceptional figures of 8-5-5-5 (I’ll explain what that means next week Rodders) while Doug spent much of the afternoon, second day in a row, in a prone position trying to reach shots that were in fact just out of reach. Rodders was fielding at Short Extra Cover (no insult meant – none taken) and seemed to spend the afternoon in competition with Doug, subtly running in front of him at opportune moments creating an occasional lesser eclipse. Dakes awoke from a coma to see an airborne cricket ball coming at him, Brez took a good catch as did Doug on the one occasion he did not go airborne, Jake and Jamie had a good bowl, and other than that the innings petered out as wickets fell to Dakes (2-18), Taggart (as above) and then to Geoff. Their last wicket did hold us up for 45 minutes until Geoff (3-18) took the final one with a cry of “mammals don’t lay eggs”. As the fittest men at Bledlow Ridge walked out to bat there was little hint of the injuries to come. Yes RolfeDog and his personal coach BirdDog strode to the wicket, the picture of health to the sound of South African voices everywhere. It transpired that the whole Dinton team had become locked into a programme whereby they had to mimic their South African slow bowler. We just talked Bucks. We also "stacked up": a phrase from Birdy' supermarket days. This is a policy whereby RolfeDog blocks for as long as possible and so achieved the slothsome feat of 26 in a stand of 106, making way for Conor who felt perfectly at home in South African surroundings even claiming to have seen an Impala in the field next door although it turned out to be Lord Keeping in riding boots. Shakey's (spectator) phone call, Shakey being the one who knew exactly where it had gone but was too preoccupied with his agent or with booking his tickets for Jedward. To be fair he did point to the spot and ten minutes later we did find it exactly at the spot he was pointing to and I am sure Apple could develop a new App for this somehow. As a cunning master plan to disguise our bowlers' injuries Geoff opened the bowling with Jamie. George was not available you see, either because he was saving lives of everyone at Princes Risborough swimming pool except for Malcolm who has not been seen for ten days, or because he has become our first injury in a two week season and is now not bowling for six weeks. Geoff went through his full array of South African accents and ended with 9 overs 2-16 while Jamie bowled what was described as "throw-downs" by one batsman, at the other end. In fact at the same time, this batsman described Geoff's bowling as "underarm" to an incoming batsman and to everyone's pleasure promptly ran himself out when Brez threw the stumps down at mid-off. To the uninitiated this means he threw the ball at the stumps from mid-off, not that he picked up the stumps and threw them around. To be honest, it being Wednesday and me now having a very poor short term memory I can't remember much about the rest of the innings. Jake bowled 7 overs and took 2 wickets including a catch off his own bowling. The Most Sartorially Dressed Greatest Sports Retailer took a catch but it must be mentioned that if you had asked me who the three best catchers are on The Ridge and in the South of England I would have said Buckets Turner, Conor and The Greatest Sports Retailer. So if I tell you three catches went down you can guess the rest. Still after a worrysome fifth wicket partnership was broken we got through them, well almost, as some flailing at the end did cause a certain amount of panic but Conor the South African and Doug the Happy Scotsman soon sorted them ourtwhile Brez (dodgy knee) bowled or hobbled from the top end. No mention has yet been made of the Sloth whose several injuries all incurred seemingly since the previous day's game not only prevented him bowling but apparently prevented movement of any sort, so it was hard to distinuish him from an Impala in the long grass. So that's three opening bowlers crocked and we have played two week's worth. RolfeDog and BirdDog reflected on their incredible fitness as they hobbled between overs while Russ was just pleased not to have ben shot at. Bledlow Village or Cublington on Sunday 3rd at home is the next hoedown; a fine way to celebrate the Jubilee Weekend.